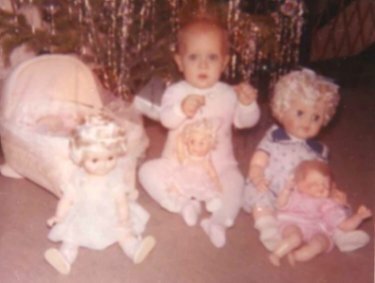 Modern dolls..... currently very collectible.......are more frequently represented in our family photos. Following are pictures of my daughter with her treasured Raggedy Andy, her gorgeous Italian Furga and other dolls from Santa. Andy went through the washer a few times......but he, his companion Raggedy Ann and the Furga still reside with their now adult "mother." "Gumdrop" periodically disappeared and was off limits for everyday play.......until she was re-gifted to my daughter 30 plus years later. Because of my tendency to hoard her, she is in near mint condition. 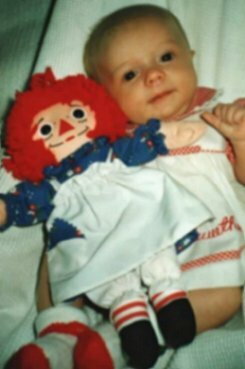 Approximately 20 years later, my granddaughters first doll was a new generation, Raggedy Ann. Raggedy Ann and Andy have been loved by those who came before us and will be adored by those who follow. 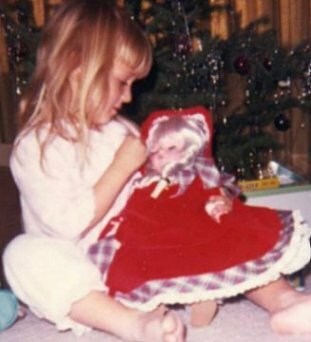 Christmas snapshots provide a look into our own childhood to reveal the gift of a favorite doll. Go dig in your closets and basements! You might be surprised and what you have forgotten.